AG Hair Salon Hollywood Florida is somewhere people go to relax and have an hour to themselves. Our clients represent us and are essentially our models outside of the salon. At AG hair salon you are part of our family. we believe in trust, honest and open communication. We Deliver first-class salon services in Hollywood, Florida that result in beautiful hair styles and personal confidence. Our Hair stylists use the latest techniques designed to expand their passion and expertise. We use only high quality products and well known brands such as L’Oreal professional, Inoa, Goldwell, Redken, wella and more to acheive the vibrant, shiny and beautiful hair you were seeking while insuring your hair stays strong and healthy. We specialize in Hair Extensions, from micro-links, to keratin based bonds, to tapes. We are only using the best hair quality to guarantee your experience. What makes AG Hair Salon in Hollywood, Florida so unique is, You. When you enter our salon, you are the most important person in the world to us. Whether you found your first gray hair and need hair color or you are going to a special event and want an elegant up-do, our hair salon is ready to help. Sometimes all you need is a few hair extensions, highlights or even a new haircut to bring out your natural beauty. 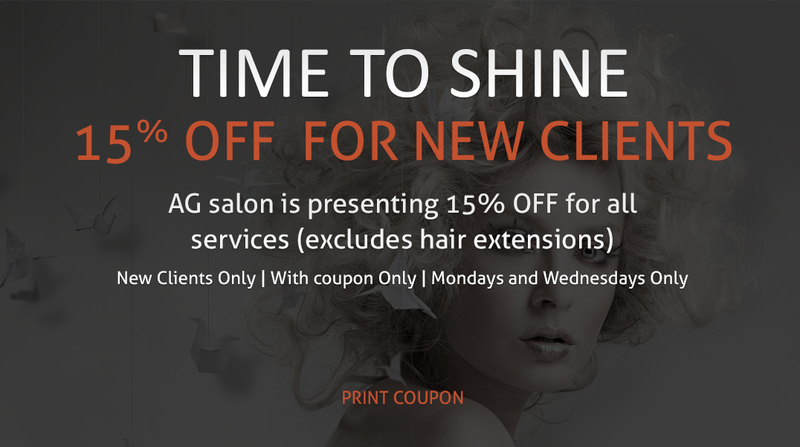 AG Hair Salon in Hollywood, Florida invites you to be a part of our salon family. We service clients from Boca-Raton, Florida – Fort Lauderdale, Florida – Hollywood, Florida and Miami, Florida. Contact us today for a free consultation!